Hyatt Place is a new kind of hotel that puts style, innovation and The Hyatt Touch within everyone's reach. Our guests will enjoy a spacious guestroom with a 42" flat panel high-definition television, our signature Hyatt Grand Bed, a plush Cozy Corner oversized sofa sleeper that is separated from the sleeping area, and complimentary high-speed Wi-Fi Internet access throughout the non-smoking hotel. Guests at Hyatt Place may purchase signature hot breakfast entrees along with Starbucks specialty coffees or enjoy a free continental breakfast. Hyatt Place also offers a variety of freshly prepared, cafe quality items, including made-to-order entrees, sandwiches, soups, salads and pizza which guests can order 24 hours a day, seven days a week via a touch screen menu in the Guest Kitchen or from the Guest Host. The complimentary Stay Fit fitness center is equipped with state-of-the-art Life Fitness cardio and strength equipment. Featuring the most advanced LCD touch screen consoles in the fitness industry, the cardio machines let users watch their TV programming while exercising. Conveniently located next to Interstate 465, the hotel is just 20 minutes from downtown Indianapolis and 30 minutes from the Indianapolis International Airport. 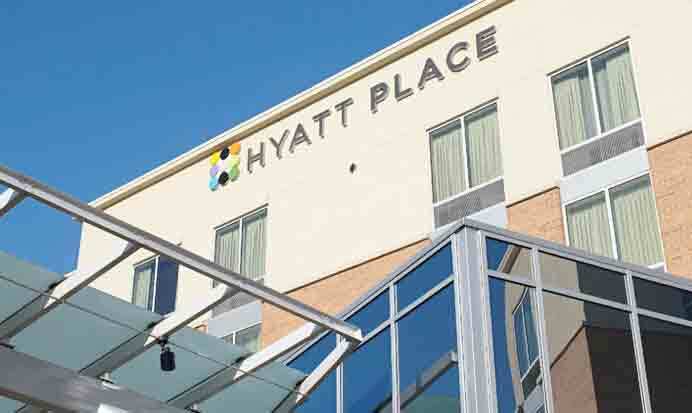 Hyatt Place Indianapolis/Keystone is situated in the Keystone at the Crossing area, close to several upscale shopping malls as well as many fine dining choices.